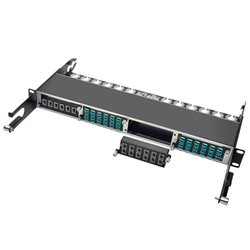 New line of cassettes and chassis work with copper and fiber installations while allowing different generations of equipment to easily interconnect. Tripp Lite, a world-leading manufacturer of power protection and connectivity solutions, has introduced a line of high-density copper/fiber cassette solutions that allow users to interconnect any combination of 10Gb, 40Gb and 100/120Gb network equipment in a simple, elegant and highly flexible way. This new line of cassettes and chassis expands Tripp Lite’s solutions to support a wide range of applications and protocols in high-density telecom and data center environments. The only solution currently on the market that offers cassettes for both copper and fiber cabling, it negates the need for costly, hard-to-manage custom breakout cables. With Tripp Lite’s modular cassette solution, all cabling and components are standard, off-the-shelf and readily available. The easy-to-use cassettes insert into a 0U or 1U enclosure panel for an interconnected copper and fiber infrastructure, allowing a large number of connections to be made in a small space. When changes to network equipment occur, the design can be modified or upgraded simply by swapping out or adding cassettes to suit the user’s needs.